Delete is one of the primitive processes performed on database management system. And it’s always a good practice to confirm the delete action of users with a message to avoid accidental clicks and data deletion. 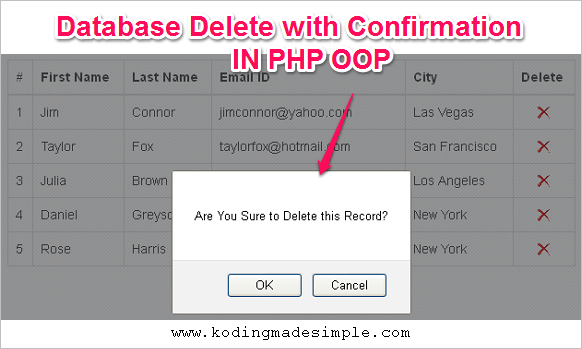 In this tutorial we’ll see how to delete row(s) from mysql database with confirmation message in php. Implementing database deletion using procedural style has been discussed a lot but here I want to show you how to achieve it using OOP Method (Object Oriented Programming) in php. For better understanding of database deleting task, I go with an example. Consider having user details stored in database. As user interface, we should fetch and display the user records in a neat grid view along with a delete button or link on each row. When the user clicks on the delete button, a message pops up to confirm the delete process. If the user clicks ok, then that particular user record will be deleted and the page refreshes to show up the remaining user records from the database. First we’ll create the database required for the example. Run the below sql statements to create database and required USERS table. Next we need to create a php class file where we place all our database transactions. Create a php file ‘DeleteClass.class.php’ and copy paste the below code to it. constructor method which establish the connection to mysql database during initialization. select_user() method which fetch and returns all the user records from users table. delete_user($id) method which deletes the user record from mysql with the given id. Now create another file ‘index.php’ in your working folder and copy paste the below code. First we load the class file we have created earlier with the line include_once('DeleteClass.php'); to callback the methods we have created earlier. The controller function will be invoked when creating new objects and this is where the database connection is established. Later we loop through the $result array and display its contents in a neat tabular format. To style the html table element we had taken advantage of twitter bootstrap css and used its classes .table .table-bordered .table-hover. Learn more about twitter bootstrap table styles here. The statement header('Location: index.php'); will redirect the page to the same url and refreshes the user table list after deletion. If the user confirms deletion with ok message, then page will be submitted to delete the particular user record from db and once again refresh the table list. And that was all about implementing data deletion process from mysql with confirmation message in PHP. Wonderful post. Thank you for updating.. CCNA Training Institute in Chennai | CCNA Training Institute in Velachery.